Tallahassee home construction activity has dwindled to a very low level as the real estate market works through the excess inventory of homes for sale. In this blog post, we examine the current state of the Tallahassee home construction market as we head full steam into the 2012 Summer months. 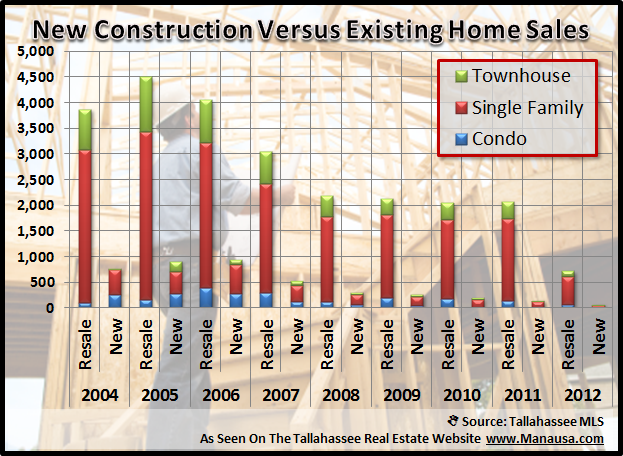 The real estate graph at the right shows the number of home sales each year, with existing home sales shown in green, and new Tallahassee home construction shown in red. The picture tells the story, new construction has declined greatly. The following graph shows the breakdown of new home sales versus existing home sales each year in the Tallahassee MLS, going back to 2004. Additionally, property types are segmented to show market saturation levels. While all new home construction is depressed in Tallahassee, look at the near-zero levels of blue and green for new construction of condos and townhouses for the past several years. 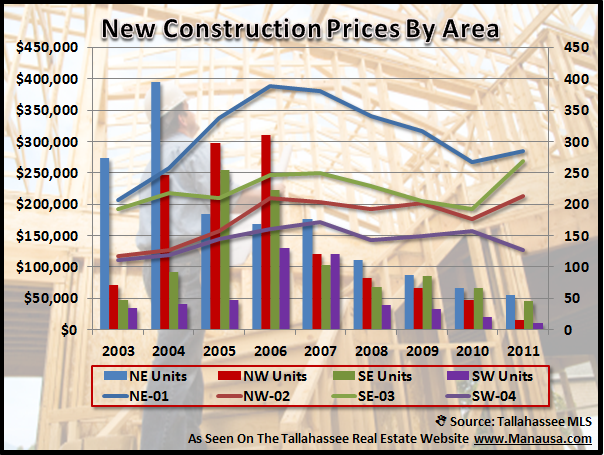 If you are curious about what it costs to build a home in Tallahassee, the graph below shows a by area analysis of new construction prices. The most expensive homes are being built in the Northeast quadrant of Tallahassee, and only the Southwest quadrant is seeing values still falling (most likely continued liquidation of excess new construction supply. Anytime I write about new home construction in Tallahassee, I like to include my very first "real estate video." I took a picture each day of a 5000 square foot home being built, then compiled it into this time-lapse Tallahassee home construction video. It has been viewed over 100,000 times on Youtube, and people from all around the world have commented on it. Tell me what you think! I hope you enjoyed our Tallahassee home construction video and if you would like to know more about building a home in Tallahassee, just drop me a note and I will schedule a time for us to discuss how to save a lot of money when you build.